I think there is power in having what you stand for, in black and white..
Or whatever color ink you prefer, on paper. Written down. That you can look at each day and remember with conviction, how you want to live your life. The Cowboy posted this the other day ..
And there are few days that go by where I don’t look at the Cowboy with amazement at how much he lives by (not sure that he always has, but he certainly is now) the Code. I have two signs of my own, hanging up in my home. I’m not sure who glances at them besides me. But I remind my daughter often if she wonders where I stand on things, to give them a glance. 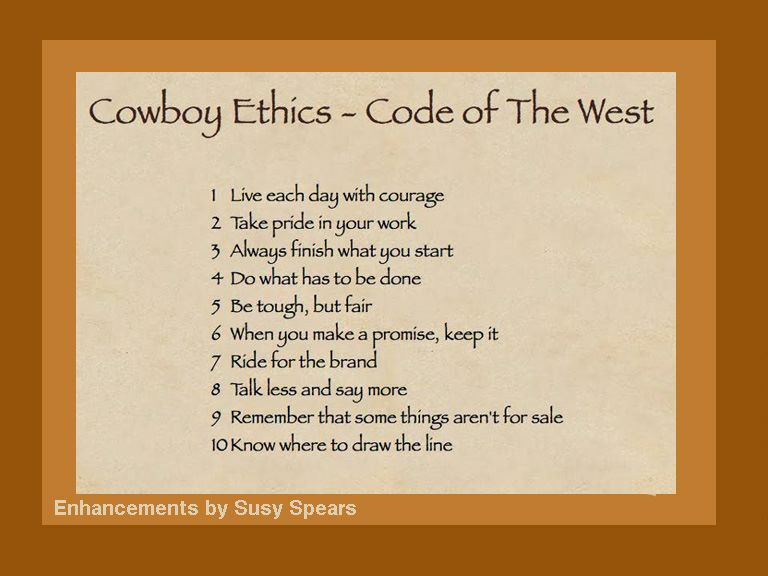 While one reflects more of the same values the Cowboy Code does and has a lot more points to consider.. It makes me laugh. And reminds me to let those who prefer drama and the degradation of others in this life, to play it out on their own. While ‘be nice or leave’ may not specifically fall as stated on the top ten list for the Cowboy Ethics.. The Cowboy likes it. And I’m pretty sure it might fall under #10. (late add) The Cowboy says we should add a #11 – Remember your Gold Toe socks. This entry was posted in Cowboy, Divorce, Lifestyle, Love, Parenting and South Dakota, Uncategorized and tagged Cowboy, Divorce, ethics, Faith, Family, Horses, Humor, South Dakota, Wisconsin by Carleen Wild. Bookmark the permalink. I have a sign on my front door that says “A twenty dollar fee will be charged to anyone who is grumpy just for putting up with you.” Not the exact wording, but you get the idea! I like to put it in black and white too….